1.Preheat oven to 400°F. Spray 2-quart, oven-safe skillet or round baking dish with nonstick cooking spray. 2.In large skillet, heat 1-1/2 tablespoons oil over medium heat. Add onion, 1/2 teaspoon salt, 1/4 teaspoon pepper and sugar; cook 15 minutes or until onion is soft, stirring frequently. (Reduce heat to low if onion begins to brown.) Stir in broth and cook 5 minutes longer; stir in 1 tablespoon sage. 3.Evenly spread onion mixture in bottom of prepared skillet; sprinkle with 1/2 cup cheese. 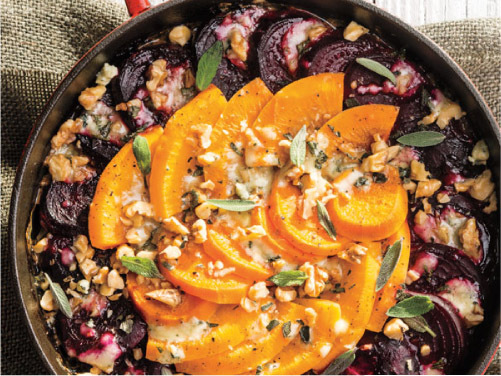 Over onion mixture, arrange beets in circular pattern, slightly overlapping, around inside edge of skillet; arrange rutabaga, slightly overlapping, inside circle of beets, then arrange sweet potato, slightly overlapping, down center of rutabaga. Evenly sprinkle with remaining 1/2 teaspoon salt and 1/4 teaspoon pepper; evenly drizzle with remaining 1-1/2 tablespoons oil. 4.Tightly cover skillet with aluminum foil. Bake gratin 1 hour 15 minutes. Remove foil; sprinkle with remaining 1/2 cup cheese, walnuts and remaining 1 teaspoon sage. Bake 15 minutes longer or until vegetables are tender and top is lightly browned. Let stand 10 minutes before serving; garnish with sage leaves, if desired.